The twenty-one philosophical personalities who represent an adventure in thinking are: Plato, Socrates, Aristotle, Epicurus, Marcus Aurelius, Thomas Aquinas, Francis Bacon, Descartes, Spinoza, Locke, Hume, Voltaire, Kant, Hegel, Schopenhauer, Emerson, Spencer, Nietzsche, William James, Henri-Louis Bergson, and Santayana. The book accomplishes what it set out to do, e.g., present an overview of the lives and thinking of many of the worlds great philosophers. 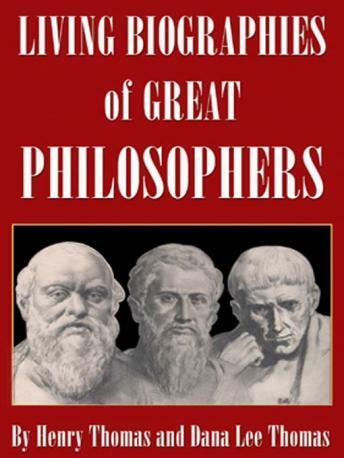 Discussed in the book are Plato, Socrates, Aristotle, Epicurus, Marcus Aurelius, Thomas Aquinas, Francis Bacon, Descartes, Spinoza, Locke, Hume, Voltaire, Kant, Hegel, Schopenhauer, Emerson, Spencer, Nietzsche, William James, Henri-Louis Bergson, and Santayana. Not so in-depth as to bore the reader with excess details, yet not so superficial as to leave the reader uninformed.